Royal Jelly is composed of an abundance of life giving superbly nutritional complexes of nature's superfood that is only fed to the queen bee. It is incredible that she lays over 2,000 eggs each day. With royal jelly being her longevity food, she has an extended life span of up to 5 years as opposed to the 3 month life cycle of the worker bee. 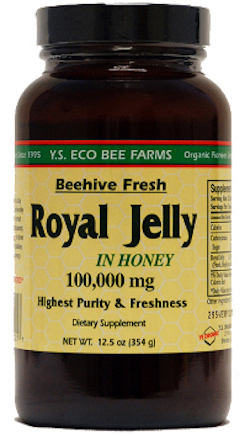 Royal Jelly is a power house of nutrients occurring in nature only as God can make it. Ours is 10-HDA, contains acetyl choline, the whole spectrum of B vitamins, catalystic factor "R", enzymes, essential amino acids, essential fatty acids, gamma globulin, lecithin, naturally formed hormones, phytosterols and much more. Raw honey is 100% pure, natural, unpasteurized and unfiltered, fresh from only beehives that are well. This true raw honey provides the highest levels of antioxidants, live enzymes, minerals and vitamins as a functional whole food. Other ingredients: quality raw honey. Contains no yeast, salt, preservatives or colors. Suggested Use: Suggested Use: Take 1/2 tsp. twice a day (i.e. in the morning and before bed) followed by a small amount of water. For best results, take regularly on an empty stomach.